Taboos, of autism and parenting at Ramblings of a Stone Age Queen is one of the best commentaries I have read about the realities of parenting an autistic child who suffers from meltdowns that can result in aggression towards herself and the parent who cares for her. This is not a fluffy opinion piece by a high functioning autism researcher sitting in his lab. This is a concerned parent talking honestly about the harsh realities, the thoughts that spring into her mind in the midst of being attacked by the child she loves. This is the story of mandyque; one parent who has stood up and said "this is happening to me". I encourage you to visit mandyque's blog Ramblings of a Stone Age Queen where the commentary is posted. If you are a parent of a child with autism leave a message of support. If you feel up to it tell your story. Help mandyque break a taboo that needs to be broken. "I have had a particularly difficult weekend with my autistic daughter, and it occurred to me that there are some things that only other parents of children with autism understand properly. But even then, there are things which are left unsaid, because we are too scared that we will end up facing criticism, or worse, social services involvement. But if we aren't honest about what is going on, we carry on suffering in silence, convinced that we are the worst parents and that we will be hated and reviled if we dared to speak of our deepest fears. On Saturday night, daughter had a major meltdown. She became so upset and confused that she attacked me, lunging forward and clawing at me, and she spent over and hour screaming blue murder. I have no idea what the neighbours must have thought, she sounded like she was being brutally tortured. The fact is, this hideous scenario occurred because she wouldn't go in the bath, then when I said it was time for bed, she wanted to go in the bath, but it was too late. Perhaps I should have given in and bathed her anyway, but it's all part of her needing to learn flexibility, that she can't always have her way, and besides, I was exhausted already and needed to go to bed myself. Finally, I was able to get her upstairs, but she lunged for me again, trying to push me out of the way, clawing at my arms and chest and screaming. This is where the shameful part really kicks in. In any other situation, if someone attacked you, the fight or flight reflex kicks in, but of course you can't fight back when your disabled child attacks you, because that is a child protection issue. Nobody considers that it's also a carer protection issue, and no carer wants to admit that they had the urge to fight back. I didn't want to harm her, and I didn't, but the urge was there. The urges included wanting to tear at her hair, putting my hands on her neck, slapping and punching her. In any other situation that would be accepted as a normal reaction, but when it's your child, it's met with shock and concern that you are an abuser. I repeat again that I did not act on these impulses, I did not harm her, but to be put in that situation is an unbearably hard thing for a parent to cope with. Eventually I managed to get her into the bathroom, where she sat on the toilet, refusing to move for over half an hour, while I got out and waited on the landing. When she is so wound up, she needs a lot of time to calm down, without stimulation and attention, so away from the TV and computer for a start! I sat on the floor, shellshocked and shattered by this latest episode and hoping that she wouldn't come and attack me again. She screamed and screamed for a while until exhaustion made it subside, but she kept winding herself up and having a little scream, which I had to ignore, while making sure that she can't come downstairs again. Finally she calmed down enough to realise that she had to go to bed, and bizarrely, once she had calmed down and come to terms with the situation, she just got up and went, as quick as that. She just stood up and walked into her bedroom, where we had a hug and a goodnight kiss and she went to bed. And that was the end of that, for her at least, the whole situation, over and done with. In the meantime, I'm ready to crack up, I don't know whether to cry or scream, I'm completely dazed by the whole event. But how do you deal with this sort of situation? I know how to calm her down, I know that putting space between us works, I know that she needs a low stimulation environment and time to process information, but what do you do when your child attacks you? Especially as they get older and stronger, you can't pick a 15 year old up and put them in time out like you can with a tantrumming toddler, you can't lock them in somewhere because that is imprisonment, and you certainly can't hit them back. Manual handling courses are available for teachers and professional carers, but parents are not allowed to do these courses for insurance reasons. There is no protection for the carer at home. Parents of teens and young adults are actually told to call the police, but what is the point of that? Criminalising a disabled young person who isn't being violent because they are bad, but because they are confused and upset? Terrifying them with a visit from a policeman, who we all know is there to catch bad people and stop them doing bad things by putting them in jail? There's little point in calling on help from social services, you end up being made to feel that you are a failure as a parent instead of being supported. The only people who truly understand are other parents who suffer the same way, but none of us get the help to deal with situations like this. A friend of mine today asked if I had a panic button, similar to the ones that elderly people use to get help, but there is no such support that I know of. What is the answer? I'm damned if I know, but taboos are there to be broken, and if one person can stand up and say 'this is happening to me', maybe others won't feel quite so alone." 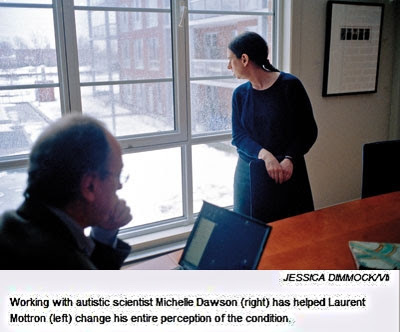 It may seem surprising to some to learn that Michelle Dawson, the central image of the "Autism is an Advantage" campaign of high functioning autism researcher and anti-ABA activist Dr. Laurent Mottron has herself formally declared that autism is a disability and a neurodevelopmental disorder. Dr. Mottron and Ms Dawson were featured recently in Nature magazine promoting the autism is an advantage beliefs of Dr. Mottron and Ms Dawson. Yet, in another very formal context, Michelle Dawson has described autism as a disability. In fact she used her autism disability as the basis for a human rights complaint against her former employer Canada Post**. 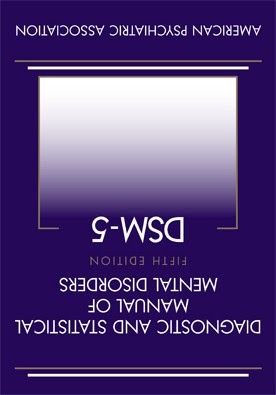 In Dawson v. Canada Post Corporation, 2008 CHRT 41 (CanLII) Ms Dawson brought a complaint under the Canadian Human Rights Act against her former employer Canada Post alleging that Canada Post had discriminated against her and harassed her on the basis of her autism disability contrary to the provisions of the Canadian Human Rights Act. The Human Rights Tribunal found that she had substantiated most of her claims and found that Canada Post had contravened sections 7 and 14 of the Act. In her complaint, dated August 9, 2002, Ms. Dawson alleges that the Respondent discriminated against her on the basis of disability, in breach of section 7 of the Canadian Human Rights Act in that it failed to accommodate her disability (autism). Ms. Dawson testified that autism is a neurological disability and that people generally do not have a good understanding of this reality. Ms. Dawson testified that autistic persons compared to non autistic people process information very differently, at a very basic profound level, really low level. In her testimony, Ms. Dawson also referred to people with Down Syndrome. She testified that Down Syndrome is in the same classification as autism. They are both developmental disorders or neuro-developmental disabilities. The Tribunal thus finds that Ms. Dawson’s disability was an important factor in the way she was treated by the Respondent in relation to the above mentioned events and that the Respondent’s conduct amounts to harassment and contravenes section 14 of the Act. In her testimony, Ms. Dawson spoke about her self-inflicted injuries. Ms. Dawson testified that, at the very worst, there was probably a week or two weeks where two weeks in a row, she would have something, that she would injure herself. She added, however, that this would be rare. According to her, she would self-injure about once a month and never more. She testified that for cuts, it would not be more than one small area affected and not more than one or two cuts, but they would be in the same place. For Dr. M., the idea of curing autism is meaningless. Violence is absolutely not a problem that is attached to autism. According to Dr. M., what characterizes autism is that the specific part of the brain which is in charge of social activities is broken in an autistic brain. According to Dr. M., self-injury is linked to autism. Dr. M. testified that, while the ordinary person will become aggressive when anxious, autistic individuals will sometimes self-injure. This is especially the case, according to Dr. M., when an autistic person cannot understand a situation or cannot get an answer to a question. According to Dr. M., self-injury is the most extreme response to a psychological impasse that has no solution. It is a response to a disorganization of the world. It is the way for an autistic person to respond to negative situations whereas non autistic persons will show anger. Dr. M. stated in his testimony that he was aware of Ms. Dawson self-injury behavior. He had seen one of the wounds she had inflicted upon herself. For Dr. M., a self-inflicted injury is a sign of a deep psychological suffering. According to Dr. M., autistic people will also have a self-injurious behavior when experiencing internal pain of physical or psychological displeasure. So, if an autistic person finds himself or herself in a situation where he or she cannot escape, or experiences a feeling of disorder, he or she may self-injure, such as biting one's arm or hand. Dr. M. added that it is very difficult for a non autistic person to understand this type of behavior. Dr. Mottron's opinion piece in Nature magazine emphasized what he considers to be the advantages of autism and spent little time discussing the serious deficits that can accompany those with autism disorders. Even Michelle Dawson described in the CHRT proceeding as intelligent and high functioning can suffer from serious Self Injurious Behavior. This father of a severely autistic young man with profound developmental delays who has engaged in serious self injurious behavior has no doubt that autism is a disability, a neurological disorder. Especially for those like my son who do not share Ms Dawson's communication and high functioning abilities and intelligence self injurious behavior is a very serous reality, a deficit, not an advantage. It is unfortunate that Dr. Laurent Mottron who has built a fine reputation for himself conducting studies and writing articles about high functioning autistics, persons with Aspergers and autistic savants, would downplay the serious deficits that accompany autism disorders. He, and his colleague Michelle Dawson, have opposed government financing in Canada of ABA treatment for autism, to this date the only solidly evidence based intervention for autism. Almost annually a naive, autism ignorant mainstream media swallows the Mottron Mantra and paints a picture of autism as something other than what it is ... a disability ... a serious neurodevelopmental disorder. In doing so Mottron and the MSM do a great disservice to those most severely affected by autism disorders. *Ms Dawson made representations as an "autistic" to the Supreme Court of Canada in the landmark Auton Case in which the SCC overturned British Columbia Court decisions which had required the BC government to fund ABA treatment for autistic children. Her application to the Court for intervenor status was supported by an affidavit from Dr. Laurent Mottron. In her representations to the Supreme Court Ms Dawson opposed ABA therapy. See Auton (Guardian ad litem of) v. British Columbia (Attorney General), 2004 SCC 78,  3 SCR 657, paragraph 5, "Indeed one of the interveners in this appeal, herself an autistic person, argues against the therapy." **Note: I was an in house labour lawyer with Canada Post in Ontario between 1993 and 1997 but had never heard of Ms Dawson until after my return to private practice in New Brunswick. 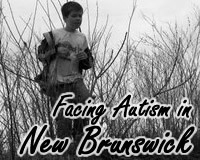 My son was diagnosed with Autistic Disorder a year after I returned to private practice and I become active in autism advocacy in New Brunswick. Ms Dawson contacted me by telephone to ask for access to a legal opinion concerning autism which she heard had been provided to the Autism Society New Brunswick of which I was president at the time. "As she headed to her patrol car, Stauffer said she heard the woman tell the dispatcher the child had entered the water. Stauffer, 31, drove to the pond in less than a minute. "I could see the child, probably hip deep, walking toward the center of the pond," she said. The officer ran toward the water, throwing her patrol belt and gun to the ground while yelling to try to get the girl's attention.But the girl was focused on the water and did not respond to Stauffer, the officer said. "The water was up to her upper stomach, she was splashing her arms and her teeth were chattering, so I ran into the water," she said. The mucky bottom of the pond made every step a challenge. "All I was thinking was, 'Get to her and get her out of the water,' " Stauffer said. "When I caught up to her, the water was up to her upper chest and lower neck." She came face to face with the girl, who turned her attention to the officer. "She was muttering, 'Cold, cold,' " Stauffer said. The officer put her arm around the girl and pulled her from the pond." The Lancaster Online article indicates that police officer Theresa Stauffer deflected any praise or credit for the girl's rescue and credited the local resident who alerted police to the situation. The Lancaster Online reports that police officer Stauffer did not want to be called a hero. To this "autism" dad though that is exactly what she is, a hero, as is the neighbor who reported to the police. For me as a father who has lived through a similar experience and whose son is safe today I read each such story having lived a similar experience. These stories do not hide the truth about the challenges facing autistic children and their families. When they end well, as this one did, I live again the fear, relief and joy I felt many years ago when I was reunited with my son. ".... is one of the 1 percent of children in the U.S. born with autism, a complex developmental disability that affects a person's ability to communicate and interact with others at varying degrees. Autism appears to be increasing because of the psychological testing that is available to detect it, said Ramona Puget, who earned a bachelor of arts in psychology and is the president of the Kern Autism Society, a local chapter in the national organization of the Autism Society. ...There is no known single cause for autism, but it is accepted that it's caused by abnormalities in brain structure or function, according to the research. It is a neurological disorder that is present at birth, but symptoms may not appear until much later "
Really? Can someone help me here? What conclusive studies have been conducted to determine that autism is increasing because of a) diagnostic changes (last significant changes in 1994) b) increased availability of testing to detect autism c) increased social awareness d) pressure to obtain autism diagnosis to access autism services and treatment? If there is no known single cause for autism, or for the autisms, as other sources will often say, how do we know that autism is present at birth or that autism is not really increasing, that it is only ascertainment factors that are creating a false impression of increases in autism disorders? Some very credible sources have pointed to the likelihood of genetic environmental interaction as the source of autism disorders. Most autism research has focused on the genetic side of the equation with little effort made to "ascertain" potential environmental causes or triggers of the various autism disorders. So how can it be said that autism is not really increasing or that autism is present at birth? Surely there are enough controversies in autism discussions without reviving the assumption that autism disorders are 100% genetic and are never caused or triggered by environmental factors? Is Cambridge University Professor Simon Baron-Cohen's latest "autism research" useless? Autism Eye reports that Autism Eye magazine editor Gillian Loughran "has been inundated with phone calls from parents expressing their annoyance at what they see as the latest trivia to emerge from Cambridge." The impugned research examined the professions of parents of autistic children to look at whether parents with professional background as engineers, scientists and computer programmers were more likely to have autistic children. It is refreshing to see parents in the UK speaking out and demanding that we focus on meaningful autism research efforts that help autistic children rather than promote careers and sell books. It is a message that should be heard loud and clear in Canada, the US and elsewhere in the "autism world". Autism Expert Psychologist Dissects Mottron's "Misleading" "Mischief"
The mainstream media (MSM) has embraced with open arms activist/researcher Dr. Laurent Mottron's "autism advantage" piece in Nature. In that article Mottron downplays the serious challenges faced by those like my son with severe autistic disorder and recasts autism disorders in the image of his mentor Michelle Dawson and several other high functioning persons with autism who work in his lab. Almost without exception the MSM has regurgitated Mottron's beliefs and opinions without serious examination of the scientific basis, if any, for those beliefs, and without offering differing views of credible autism experts. An autism expert who offers a critique of Mottron's opinion piece is Dr. Travis Thompson who describes the piece as "mischief" and "misleading". Dr. Laurent Mottron, professor in the Department of Psychiatry at the Faculty of Medicine of the Université de Montréal, at Hopital Riviere-des-Prairies, recently wrote in the journal Nature, that his research team has published articles indicating some people with autism have “superior capabilites in multiple cognitive operations such as perception and reasoning.” Exaggerating positive characteristics of some individuals with autism is not necessary to accord them the respect they deserve." Mottron’s research team has published articles indicating that some people with autism have “superior capabilites in multiple cognitive operations such as perception and reasoning”. Dr. Mottron is referring to his numerous laboratory cognitive neuroscience studies or psychological test investigations he has published showing on average, some samples of some people with ASDs score higher on some measures or some subtests than some comparison neurotypical samples. I have found no studies by Dr. Mottron showing that the “superior capabilities” which he has measured in the laboratory in autism manifest themselves in advantages in daily life. As unlikely as it may seem, I have found no articles by Dr. Mottron indicating there are any measurable disadvantages of having autism, which seems odd in light of the fact that many thousands of articles indicating that such differences exist. While I have respect for strong advocacy on behalf of individuals with autism, misrepresentation of an enormous body of scientific evidence is not helpful to individuals with autism or their families. [Nature. 2011 Nov 2;479(7371):33-5. doi: 10.1038/479033a]"
Dr. Thompson also authors a blog, Oughtism, where he commented further on Mottron's autism advantage article. In Autism: Visual Memory, Intelligence, and According Respect Dr. Thompson describes the skill used in the tests on which much of the Mottron opinions are based as being essentially that, a specific skill which can not be equated more generally with intelligence. He makes the point that autistic persons are deserving of respect ... period ... without the need to demonstrate an alleged "superiority" in a specific area. 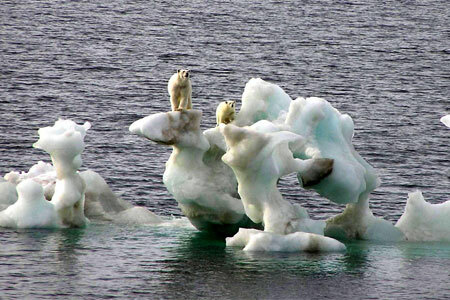 Dr. Thompson also questions the appropriateness of using a term like "superior" in a scientific article. "It is not my purpose at all to diminish the importance of unique cognitive abilities of many individuals with autism, but to suggest that the ability to perform complex visual configural search tasks with short latencies, as is involved in Mottron’s and his colleagues laboratory and clinical testing tasks, likely has a limited amount to do with what is usually meant by intelligence. Intelligence is distinguished by ability to use abstract symbols for functional communication in attaching meaning to one’s experiences and in solving problems. Most people with autism display such skills, some to extraordinary degrees. Visual memory for configurations is not central to intelligence, though it is indeed a unique skill, very beneficial in the visual arts, as shown here with Stephen Wiltshire, and mathematics and computer science." Moreover, as I pointed out recently on my website, Autism Treatment, to suggest that any group of people must meet some measurable criterion on a test, like shorter latencies on a visual search task, in order to be accorded respect by the rest of society and our world community is inherently offensive. People with autism deserve equal treatment and rights as everyone else because they are members of the human family. They do not need to prove themselves. “When you are content to be simply yourself and don't compare or compete, everybody will respect you,” Lao Tzu." I have never been a fan of Dr. Laurent Mottron's brand of autism activism and have said so on many occasions. I am a lawyer who has represented a number of persons with autism and Asperger's without receiving any compensation, even from Legal Aid for doing so. I have also been an advocate for evidence based early intervention, autism specific training and accommodation for teachers and aides working with autistic children in our schools and for adult autism specific residential care and treatment facilities. As an autism advocate I have visited the psychiatric hospital facilities where some severely autistic adults live out their lives after parents grow old, feeble and eventually die. Still, my opinions are not those of an autism health professional. 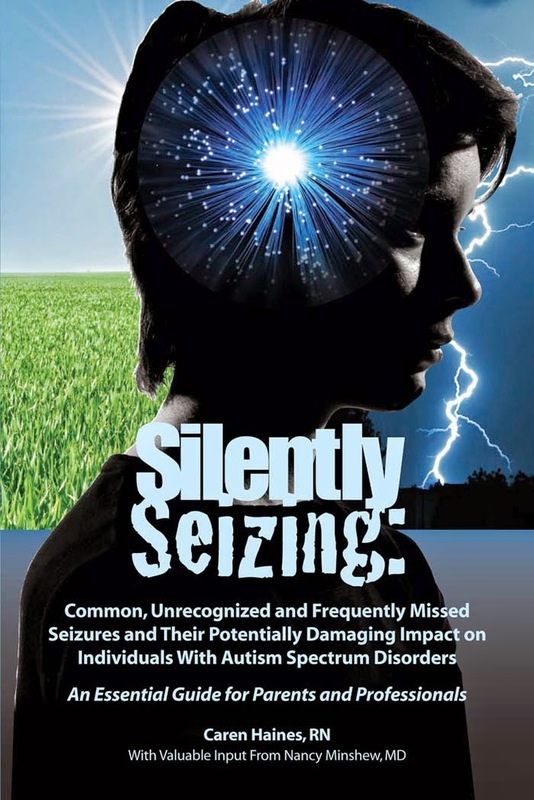 My experience over almost 16 years as a parent of a severely autistic child are of no weight whatsoever in the minds of government, courts, the mainstream media or an activist/researcher like Dr. Mottron. I am after all just another hysterical, ignorant, ill informed and biased parent. Dr. Travis Thompson, however, is a psychologist with academic and clinical experience over many decades and his views are harder to dismiss. Or they would be if the MSM bothered to research and read his opinions. Hopefully someday the MSM will grow up and consult the opinions of experts like Dr. Thompson who, very professionally and politely, show that the Mottron brand of autism activism can be mischievous and misleading. Dr. Travis Thompson is Professor in the Department of Pediatrics at the University of Minnesota (Minneapolis) where he is affiliated with the Department of Pediatrics Autism Clinic and the Center for Neurobehavioral Development. He received his doctorate in Psychology at the University of Minnesota and did postdoctoral training at the University of Maryland and advanced behavioral science training at Cambridge University (UK). He spent several years as the Executive Program Director of a community-based behavior therapy program for young children with autism spectrum disorders in Minneapolis, MN where he directly supervised services to a large number of children with ASD. He has served as a consultant to public school autism programs in Minneapolis and St. Paul, MN and Nashville TN. He is a licensed psychologist (Minnesota). Travis Thompson has worked in the field of developmental disabilities as a researcher, teacher and clinician for over 35 years. He was previously Director of the John F. Kennedy Center for Research on Human Development at Vanderbilt University, and the Institute for Child Development (University of Kansas Medical Center). He was co-editor of one of the first books concerned with behavior therapy methods for individuals with developmental disabilities. He has published over 240 articles and chapters and 27 books, including Self-Injurious Behavior: Genes-Brain and Behavior (with Schroeder and Oster-Granite) published in 2001 and International Handbook of Applied Research in Intellectual Disability (with Emerson, Hatton and Parmenter, 2004). He has been an invited speaker in 13 countries and 40 states within the U.S. He has held numerous offices and received awards for his work in developmental disabilities including serving as President of the Division on Mental Retardation & Developmental Disabilities (33) of the American Psychological Association. He was recipient of the Don Hake Award of Division 25 of the American Psychological Association for "Exceptional Contributions to Basic Behavioral Research and its Applications”. Thompson was recipient of the American Association for Mental Retardation Research Award (1995), the Arc USA Distinguished Research Award (1996), and the Academy on Mental Retardation Career Research Award (1998). He has served on numerous national committees, including the Mental Retardation and Developmental Disabilities Research Committee of the National Institute of Child Health & Human Development as well as other federal agencies and the American Psychological Association. He has previously served as a member of professional advisory committees to autism parent advocacy organizations in Minnesota and Kansas. If you have been to this blog before you know that I talk about autism as a disorder not as an advantage. If someone does not have any deficits in daily functioning ability then, by everything I have read in the DSM's, and in materials written by psychologists, psychiatrists and pediatricians working with, and diagnosing, autistic children and adults they should not have one of the "autism spectrum disorder" diagnoses. It is my deeply rooted belief that it is important to speak honestly about autism and the challenges it presents, particularly for those persons who are severely affected by autism. I do not believe that autism, a mental disorder, is an advantage and my commentaries reflect that belief. That does not, however, mean I agree with the flimsy argument that describing autism challenges honestly means that I am not recognizing the rights of autism persons or recognize that an autistic person has any intrinsic value as a human being. That argument is based on nothing more than ideological rhetoric. 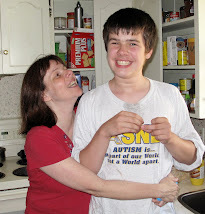 I love my severely autistic, low functioning son Conor very much. I care for him 24/7 and have done so during his nearly 16 years. I speak honestly about his many deficits and challenges including his intellectual disability, his self injurious behavior,and his inability to function independently in daily life. But none of those things mean that I do not recognize his intrinsic value as a human being. That ludicrous argument is contradicted by the care I have given, and the commitment I have made to him, every day of his nearly 16 years. There is nothing exceptional about what I have just said. Parents almost uniformly make sacrifices every day for their autistic children, every day. I am just one of many, many thousands of parents who make those same commitments to our autistic children. 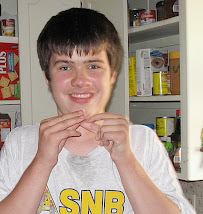 I also recognize the contributions to my life that my autistic son makes every day of his life. He is without any reservation a great joy in my life. 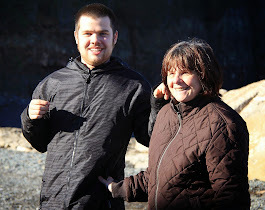 Where I differ from some parents is that I do not believe that the joy my son brings to my life, unlike his very serious challenges, arises from his Autistic Disorder (his actual diagnosis). My son brings me joy on his own terms because of who he is as an individual. 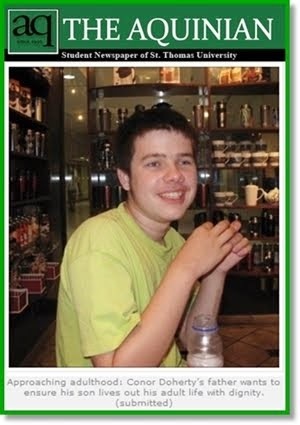 Those who would say that his smiling face, as shown on this site, is a feature of his autism rather than a feature of his own distinct personality as Conor Doherty do not know him. I do. And I love my time with him; especially our almost daily walks. The pictures that follow were taken this morning. It is routine for Conor and Dad to go for trail walks, except when winter has arrived with full snow packed force. This morning Conor was in Run, Jump, Fly mode and had to wait several times for Dad to catch up. I enjoyed the walk. I enjoyed the outdoors. I enjoyed the Conor advantage. Some people say that it is unfair to describe a person with autism as either severely autistic or low functioning. Such rhetoric is sheer nonsense that helps hide the very existence of people with severe autistic disorders. In Edmonton a severely autistic boy killed by his father in a murder suicide two years ago is now the subject of a fatality inquiry in Edmonton. The inquiry is being reported on a number of major news outlets including CBC, CTV and the Edmonton Journal. Unfortunately it takes a tragedy before the lives of those who are severely autistic are acknowledged by the media. I do not mean and I do not insinuate that in this case the father was in any way "justified" in his actions, or that his son's severe autism "caused" the father to take their lives. I am simply pointing to the challenges faced by the severely autistic boy in his short life, by service providers, by the family, and by the father who broke from various challenges, including his son's severe autism disorder, job loss and debt loads. Much of the reported evidence details the father's stress in living with, and caring for, his severely autistic and intellectually disabled son. Another was living without him, seeing first hand the institutionalized life that awaited his son. According to reported testimony the father "snapped" after seeing the group home where his son was about to be sent to live. "Jeremy’s parents reported he had “blow ups” several times a day, banged his head when unhappy and displayed other difficult behaviours. The agency helped the family find daycare for the boy and he was placed in a specialized school program for children with special needs. But by 2007, Jeremy’s behaviour had worsened, Caputo told the inquiry. He was routinely sent home from day cares for striking and biting infants. At one point, he head-butted his father while leaving the hospital, knocking Bostick unconscious. Caputo said she couldn’t physically handle Jeremy and her relationship with Bostick had virtually collapsed just before the deaths in 2009. Caputo described a combination of waits for services and said some agencies dropped the family because staff couldn’t handle Jeremy’s violent outbursts." The mainstream media routinely publish "feel good" stories about autism. The "autism is an advantage", "autism is beautiful", "joy of autism" rhetoric is routinely offered up for public consumption. It is a sad reality that it takes a tragic event like this murder suicide to force the realities of severe autistic disorder, the intellectual disability and serious behavioral challenges that often come with it, into the mainstream media spotlight. The current inquiry will have heard the evidence and will hopefully be able to make some significant, helpful recommendations for persons like Jeremy and his family. As the father of a severely autistic son with intellectual disabilities I recommend that we all start by talking honestly about the realities of severe autism and stop the harmful nonsense of pretending that it does not exist. 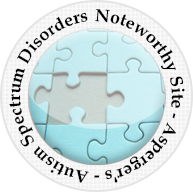 Will DSM5 Result In Some Very High Functioning Autism Personalities Losing Their Autism Disorder Diagnoses? 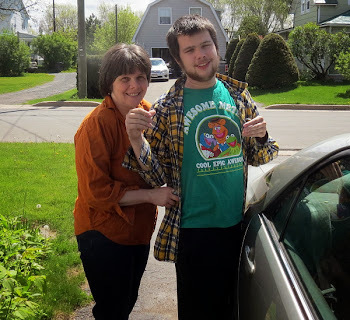 My concern has been that people like my son who are currently considered autistic with intellectual disabilities will lose the autism diagnosis with serious repercussions both in receipt of services, and in research and understanding affecting their disabilities. D. Symptoms together limit and impair everyday functioning." Even without the clear language of the DSM5 requiring impairment of everyday functioning, further divided by levels of severity of impairment, it has always been difficult for me to understand how or why some very high functioning autism personalities ever received a mental health disorder diagnosis under the DSM-IV when they are obviously very high functioning. Autism personalities, including Michelle Dawson, Ari Ne'eman and John Elder Robison have all realized considerable success in life, in university, in self owned business activities, in challenging work environments like Canada Post Corporation, in making legal representations to administrative tribunals and the Supreme Court of Canada, in acting as researchers and as activists promoting their views of autism disorders before government committees. Some have married and raised children while others have maintained professional relationships lasting several years. It has never been at all clear to me why any of them would want a label which reflects a mental disorder under the DSM-IV given their great successes in meeting life's challenges. With great regularity these autism personalities also appear in various major media productions advocating their perspectives on what it means to be an "autistic" and, in Dawson's case, advocating against government funding of ABA treatment for autistic children, other people's autistic children. When the public turns on their television, reads their daily newspapers or browse the internet for news of autism they do not see, with any regularity, the many persons with autism disorders engaging in serious self injurious behavior, wandering from their homes and schools, and into dangerous traffic and waters. The public does not see the many persons with autism living in group homes, hospitals and psych wards. No, the public sees Michelle Dawson, Ari Ne'eman, J E Robison and other very high functioning "autistics" and they see them over and over and over again. The DSM5's new Autism Spectrum Disorder label is actually misleading in so far as the condition could now more accurately be called Asperger's Spectrum Disorder. But it does expressly require, as a mandatory condition for receiving an ASD diagnosis, that Symptoms together limit and impair everyday functioning. Will Dawson, Ne'eman and Robison be able to demonstrate, despite their well known abilities and successes in various areas of life, that somehow they possess social and communication challenges, along with restricted, repetitive patterns of behavior, interests, or activities and that together these deficits limit and impair their everyday functioning? Or will the day arrive when very high functioning autism and Neurodiversity activists practice some reality acceptance and acknowledge that they do not suffer from an autism disorder, or any other mental disorder, and that they are in fact capable, competent and accomplished individuals who should not be trying to dictate to parents and professionals alike what it means to have autism ... autism disorder? In Diagnoses of Autism Spectrum Disorders Lack Reliability Pysch Central senior news editor Rick Naubert Ph.D., (article reviewed by John M. Grohol, Psych D) reports on a new study by Catherine Lord, Ph.D. and colleagues that examined the relationship between autism diagnoses and behavioral appearances at 12 university sites. The found that clinical distinctions among subtypes of autism spectrum disorders were not reliable and speculated that regional variations could be affected by availability of services for those with autistic disorder in some regions. Conversely greater stigmatization associated with autistic disorder could also affect the type of ASD disorder received. "The authors point out that their study results have implications for revisions of current diagnostic frameworks. Neurodiversity activists, including Mottron and Dawson, will not be happy with any mention of cognitive functioning dimensions or levels in connection with autism disorders. It will be interesting to read their statements opposing the results and the suggested implications of the Lord study. 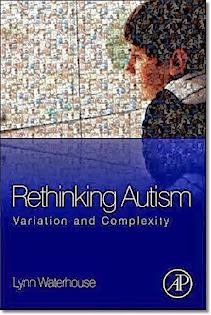 It is also interesting to note that association with the lower functioning end of the Autism Spectrum, the Autistic Disorder category which contains the vast majority, the 70% of autistics with intellectual disabilities, is considered to be so stigmatizing as to affect the type of autism spectrum diagnosis given by health care professionals. 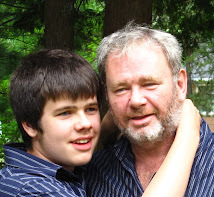 "Harold Doherty is a New Brunswick labour lawyer whose son Conor is “severely autistic,” barely communicates and expresses odd behaviour. He’s sure Conor will never be able to work and he’s worried what will happen to his son should he ever die and be unable to care for him. Ms. Dawson said it’s unfair to categorize someone as low functioning or high functioning. She and Dr. Mottron believe many tests that are used to determine level of functionality are inappropriate. Less commonly used tests such as Raven’s Matrices, which doesn’t require verbal instruction to complete, can actually reveal very high intelligence levels." I had tried during my discussion with Ms Boesveld to indicate to her that functioning levels in autism disorders are not simply related to IQ tests, that they relate to the functioning levels in the real world, in daily life. I gave as a specific example the fact that autistic children have a tendency to wander away from home and school, sometimes with tragic consequences. That information did not appear in the National Post article. The article noted my description of my son as severely autistic in quotation marks and published Michelle Dawson's personal opinion that it is unfair to categorize someone as low or high functioning. I describe my son as severely autistic and low functioning because the professional assessments and diagnoses "autistic disorder, profound developmental delay" support those descriptions. I describe my son as severely autistic because of his limited communication, his limited demonstrated understanding of the world or the dangers the world presents in daily life. I describe my son as severely autistic and low functioning because I have cared for him 24/7 over a period of almost 16 years, because his safety, security and well being depend on receiving 24/7 care and because I love him too much to hide the daily and serious functional challenges he faces in life. 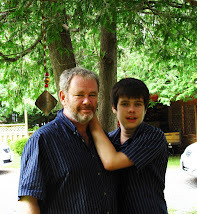 I do not think it unfair to speak honestly about the severity of my son's Autistic Disorder. Apparently the drafters of the DSM5 do not take issue with my use of such language even if the "learned" Michelle Dawson does. I was privileged yesterday to be able to attend a presentation by autism expert David Celiberti Ph.D., BCBA-D, President of the Association for Science in Autism Treatment. David Celiberti is an advocate for evidence based treatment for autism disorders. 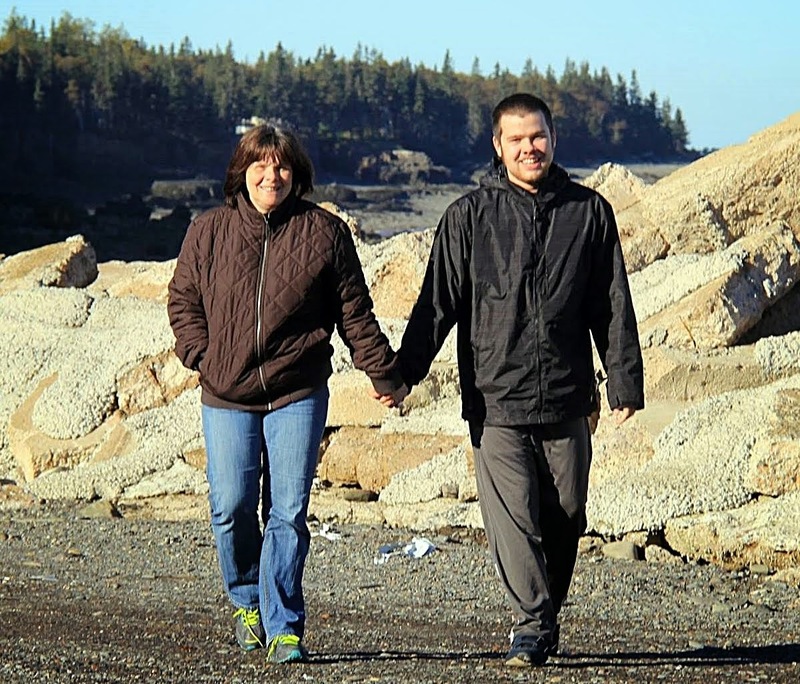 He also works directly with autistic children in two states, Maine and New Jersey. Here in New Brunswick, Canada we have been fortunate to have enjoyed his contributions to the development of the UNB-CEL Autism Intervention Training program on several occasions. Yesterday, a day ahead of a two day workshop he is presenting with the UNB-CEL AIT program, Celiberti took time to speak about evidence based autism treatments to interested parents and professionals at the Autism Connections Center here in Fredericton. It was a beautiful, fall day but it was well worth spending part of the afternoon to learn more about understanding the importance of evidence based treatment of autism disorders, and learning from David Celiberti's academic, professional and clinical experience in the application of evidence based, ABA treatment for children with autism disorders. A very comprehensive list of credible authorities that have reviewed the evidence basis of autism treatments was presented along with some suggestions on how to evaluate specific autism treatment programs and service providers. Anyone with an interest in understanding the evidence basis of the hundreds of purported autism treatments could begin by visiting the Association for Science in Autism Treatment website and subscribing to the ASAT Newsletter. Another edition of the ASAT newsletter is expected to be issued today. The pictures above were taken of my son Conor during our early morning walk yesterday. We have enjoyed many such walks and yesterday was a beautiful fresh fall morning that we both enjoyed. Most of the rest of the day was also great. Conor is a lot of fun, notwithstanding his Autistic Disorder. I enjoyed every moment with him ... except as the day drew to an end. At about 7:30 pm last evening Conor started to repeat the phrase school on Sunday, school on Sunday, school on Sunday .... endlessly. He also began slapping his head and biting his hands, wrists and legs. My attempts to communicate with him and modify his behavior, which apparently Dr. Laurent Mottron, and his mentor Michelle Dawson, would consider advantageous behavior, were only mildly successful. I tried to get him into his bedtime routine in the downstairs washroom, to get him brushing his teeth, washing his face etc. The immediate result was a full scale meltdown which I overcame simply by loudly commanding him to begin brushing his teeth. As Conor completed his bedtime preparation he calmed down. At 8:00 pm he went to sleep on the living room couch as he often likes to do. I placed pillows under his head and covered him with lots of thick heavy blankets, then stayed nearby working at a computer in the adjacent kitchen. Conor made some gentle singing and whistling sounds but engaged in no more self injurious or loud behaviors as he quietly went to sleep. I was thankful, for his sake and mine, that my son's autism advantage had disappeared for the night, that his slapping, biting and screaming had stopped and that he was able to get some sleep. 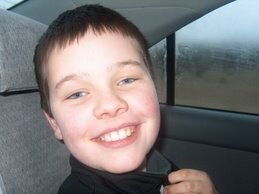 I look forward to another beautiful morning walk with Conor today but I hope that his autism advantage does not return. If you authored or coauthored several journal articles a year over many years, involving high functioning, highly intelligent persons with autism and surrounded yourself with very intelligent, high functioning autistic researchers would they influence your perception of autism? In the case of psychiatrist, and anti-autism cure, anti-ABA activist, Dr. Laurent Mottron, who has published many journal articles involving high functioning autism participants, the answer is yes. Dr. Motton has acknowledged repeatedly that his perception of autism has been influenced by his professional relationship with the very intelligent, high functioning autistic Michelle Dawson. In his latest comment in the journal Nature Dr. Mottron states that the half dozen autistic persons who form part of his research team are "typical autistics". As the father of a son who is not one of Mottron's "typical autistics", who is in fact one of the approximately 70% of persons with Autistic Disorder (not autism generally) who also have intellectual disabilities and is severely affected in his understanding of the world and his daily functioning skills I am left shaking my head once again at Dr. Mottron's characterizations of autism. Once again, prominent media headlines around the world are screaming the Mottron mantra that autism is an "advantage". Dr. Mottron acknowledges that many with autism are considered intellectually disabled although he expresses his doubts about the figures, saying he doesn't believe them. His vague caveats about the serious challenges faced by so many with autism are buried in the article and do not form part of the autism is an advantage headlines. Maybe Dr. Mottron should start hiring some of the many persons with Autistic Disorder and intellectual disabilities, including some of the adults living in institutions including psychiatric hospitals. Maybe he should get out of his lab and join one of the search and rescue teams that are regularly called out to find autistic children who wander away from home and school. Perhaps he could join the tertiary care team at the Stan Cassidy Center here in Fredericton and help the autistic children and youth with severe behaviour challenges that they treat. The caseload the Stan Cassidy handles is so overwhelming that the administration had planned a few years ago to disband the autism team because the workload was so great it was threatening its ability to provide other services offered by the center to persons with neurological injuries. The autism team was continued after public opposition led by parents of children with autism, parents who have to deal 24/7 with the daily realities of their children's autism disorders. 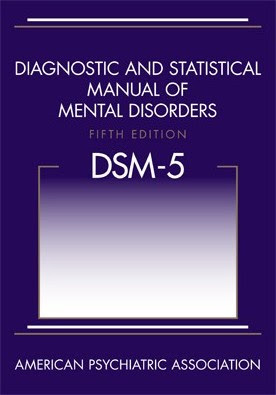 I am surprised Dr. Mottron is not fighting the American Psychiatric Association's proposal to combine the various autism disorders into one new Autism Spectrum Disorder in the DSM5, the proposed new version of the APA's Diagnostic and Statistical Manual of Mental Disorders. 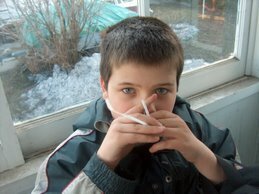 After all "typical" autism for Dr. Mottron is not a disorder, it is an advantage.